Flash is a happy, healthy, handsome 2 year old loving boy. He is happiest just being near you and wants to make you happy too! Flash is being co-fostered by two families for double the love and has had no problem falling into both households with other pups. He is very sweet and loves affection giving you “the paw” or a gentle nudge for cuddles. He feels important guarding his home, but is easily distracted when called and acknowledged, welcomes folks when they come through gate and are friendly. Flash can feel unsure when going out in the big wide world for walks, especially when he sees another dog. He needs a confident and experienced owner with that is also very patient to help him navigate his new world and understand that right now he is not Mr popular social butterfly. 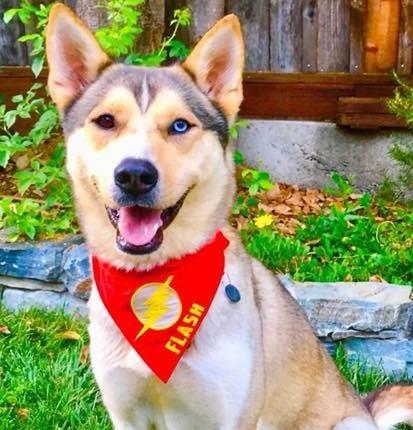 Flash is progressing and doing extremely well with his behavioral training in the few weeks he’s been in foster care and demonstrates that he is very capable of continuing to improve with instruction and direction. He does a great “sit” and handshake, he is a very quick learner as he’s eager to please. He’s very well house trained, loves to be handled, and “respects authority” from human and dog alike. Rides great in car. No “flight-risk”/escape artist behaviors noted, though he is athletic and can jump quite high, so secure tall fence would help keep him safe. Sleeps comfortably in his bed after he is used to his new surroundings and will give you the most darling lil “check-in” smooch when he hears you stirring from bed in the morning. Loves to play with toys and other dogs. He has done super with all his foster fur-siblings and it is reported that he does well with small dogs. He may do well as an only dog as well and he is person-centric (he loves his human(s!). As with any new dog, he does need careful introduction with another pup. He’s reported to be great with children, though he is a young large rambunctious dog that might run into or knock over little ones, so maybe larger older kiddos would be better. He is just a goofy sweetheart that yearns so deeply for the right family that he can give all his love and adoration to! take a look at the videos and see it for yourself! He is a neutered Male, 2 years 8 months old, Housetrained, Lead Trained, good with Children, good with Large Dogs, has Rabies vaccinations, has DHLPP vaccinations, microchipped.